CBT) is a psychosocial intervention that is the most widely used evidence-based practice for treating mental disorders. Guided by empirical research, CBT focuses on the development of personal coping strategies that target solving current problems and changing unhelpful patterns in cognitions (e.g. thoughts, beliefs, and attitudes), behaviors, and emotional regulation. It was originally designed to treat depression, and is now used for a number of mental health conditions. The CBT model is based on a combination of the basic principles from behavioral and cognitive psychology. It is different from historical approaches to psychotherapy, such as the psychoanalytic approach where the therapist looks for the unconscious meaning behind behaviors and then formulates a diagnosis. 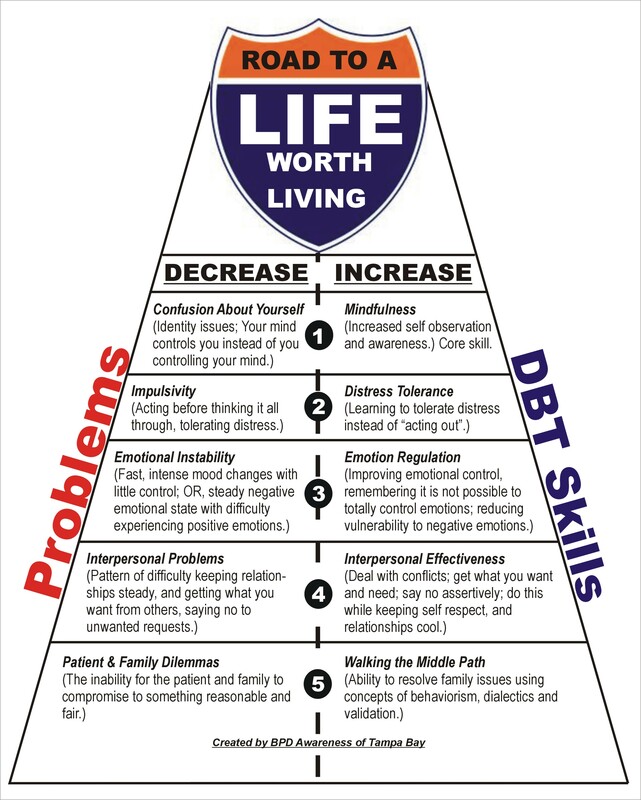 Instead, CBT is “problem-focused” and “action-oriented”, meaning it is used to treat specific problems related to a diagnosed mental disorder and the therapist’s role is to assist the client in finding and practising effective strategies to address the identified goals and decrease symptoms of the disorder. CBT is based on the belief that thought distortions and maladaptive behaviors play a role in the development and maintenance of psychological disorders, and that symptoms and associated distress can be reduced by teaching new information-processing skills and coping mechanisms. Rational emotive behavior therapy (REBT), previously called rational therapy and rational emotive therapy, is a comprehensive, active-directive, philosophically and empirically based psychotherapy which focuses on resolving emotional and behavioral problems and disturbances and enabling people to lead happier and more fulfilling lives. REBT was created and developed by the American psychotherapist and psychologist Albert Ellis who was inspired by many of the teachings of Asian, Greek, Roman and modern philosophers. 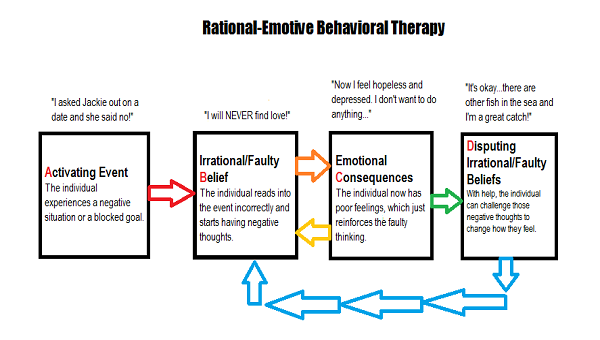 REBT is one form of cognitive behavior therapy (CBT) and was first expounded by Ellis in the mid-1950s; development continued until his death in 2007. A fundamental premise of REBT is humans do not get emotionally disturbed by unfortunate circumstances, but by how they construct their views of these circumstances through their language, evaluative beliefs, meanings and philosophies about the world, themselves and others. This concept has been attributed as far back as the Roman philosopher Epictetus, who is often cited as utilizing similar ideas in antiquity. In REBT, clients usually learn and begin to apply this premise by learning the A-B-C–D-E-F model of psychological disturbance and change. The A-B-C model states that it is not an A, adversity (or activating event) that cause disturbed and dysfunctional emotional and behavioral Cs, consequences, but also what people B, irrationally believe about the A, adversity. A, adversity can be an external situation, or a thought, a feeling or other kind of internal event, and it can refer to an event in the past, present, or future. REBT commonly posits that at the core of irrational beliefs there often are explicit or implicit rigid demands and commands, and that extreme derivatives like awfulizing, frustration intolerance, people deprecation and over-generalizations are accompanied by these. According to REBT the core dysfunctional philosophies in a person’s evaluative emotional and behavioral belief system, are also very likely to contribute to unrealistic, arbitrary and crooked inferences and distortions in thinking. REBT therefore first teaches that when people in an insensible and devout way overuse absolutistic, dogmatic and rigid “shoulds”, “musts”, and “oughts”, they tend to disturb and upset themselves. Further REBT generally posits that disturbed evaluations to a large degree occur through over-generalization, wherein people exaggerate and globalize events or traits, usually unwanted events or traits or behavior, out of context, while almost always ignoring the positive events or traits or behaviors. For example, awfulizing is partly mental magnification of the importance of an unwanted situation to a catastrophe or horror, elevating the rating of something from bad to worse than it should be, to beyond totally bad, worse than bad to the intolerable and to a “holocaust“. The same exaggeration and overgeneralizing occurs with human rating, wherein humans come to be arbitrarily and axiomaticallydefined by their perceived flaws or misdeeds. Frustration intolerance then occurs when a person perceives something to be too difficult, painful or tedious, and by doing so exaggerates these qualities beyond one’s ability to cope with them.